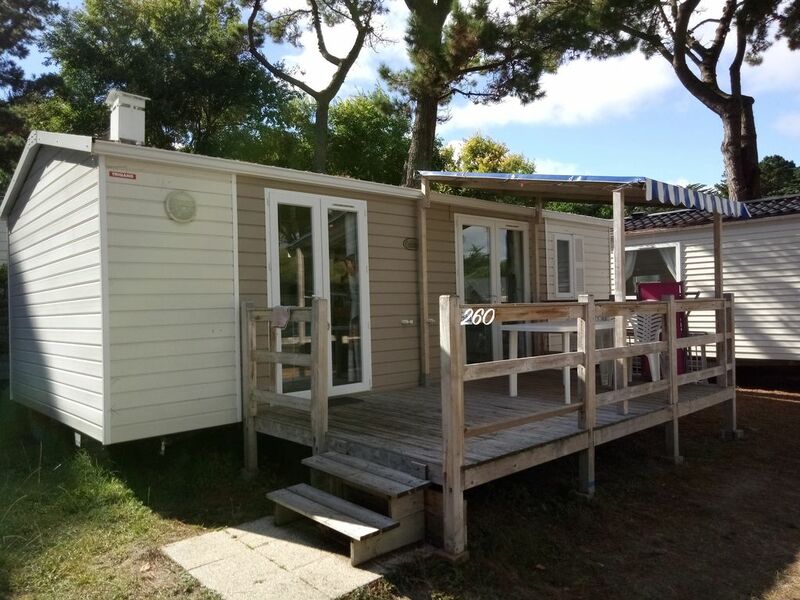 Mobilhome 4/6 people in the holiday village of Conguel **** in Quiberon 10 meters from the beach. Outside, the location offers a dedicated parking space and a fully covered terrace. Our little extra: we put at your disposal 5 bikes and an umbrella bed! The campsite offers the following services: a bar, a restaurant, a take-away service, a grocery store. Access to the play areas is also free: inflatable structures, slides, swing, petanque courts, barbecue area. The Fun Pass Club offers the following services: the kids' club and the aquatic area. The latter is composed of outdoor pools (suitable for adults and toddlers), a covered balneotherapy pool (with Jacuzzi) and water slides. In order to benefit from the fun pass club, all you have to do is buy the fun pass. If you provide us with your details (last name, first name, age of each traveler, email address, and license plate) 4 days before your arrival, you can benefit from 20% by ordering them 72 hours before your arrival directly on the SIBLU website. The mobile home is located at Pointe du Conguel, a mythical place on the peninsula of Quiberon to walk around and observe the surrounding islands (Houat, Hoedic and Belle-ile). Inside: TV, kettle, oven, microwave, coffee machine, toaster, hairdryer, fridge with freezer, aspirateut, iron, board games, cot. Others: Free Wifi at the campsite bar, 4G network. Cleaning: the mobile home must be made clean. End of stay cleaning is not included in the price and is offered up to 70 euros.